Why does it smell when I pee? Asparagus. It’s the asparagus. It should come with a warning label. Hee. Hee. 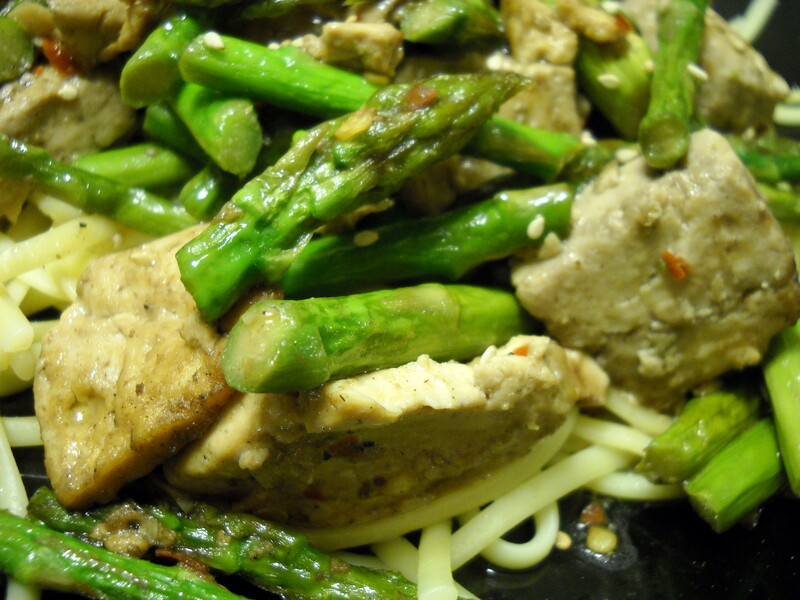 For tonite’s co-op meal, I cooked a spicy tofu and asparagus stirfry. The recipe comes from Vegan Fire and Spice. The meal was good, but I wasn’t blown away by it. It wasn’t spicy. I added more red pepper flakes to my serving. I was glad the asparagus stayed crispy. There is nothing worse than soggy asparagus. The stirfry was served with noodles, a side salad and dessert. Dessert! That was the best part of this meal. Holy tofu Batman! I made a peanut butter cup cake for dessert. Usually I do not make dessert during the week, but since I was sent a vegan dessert cookbook to review I decided to make this delicious cake. It was moist and perfect. I could not find one thing wrong with this cake. 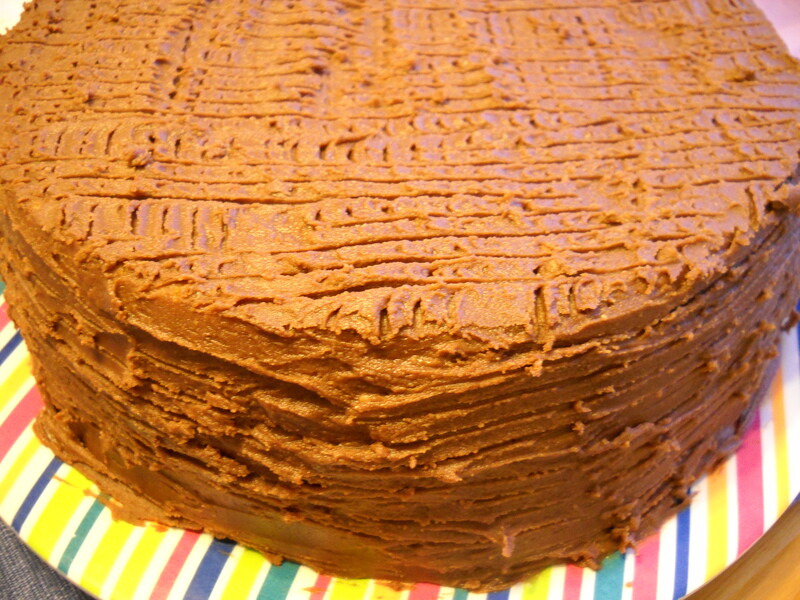 The ingredients were simple and the cake tastes like the title. You feel like you are eating chocolate peanut butter cups in cake form. Heaven in your mouth. I am going to make some cookies this weekend from the book and some type of cake or cheesecake next week for the co-op. I feel I cannot write a proper review on the book without trying at least a handful of recipes. Last night we were served Indian food. The dish was Aloo Gabi and dry-cooked garbazo beans on a bed of sauteed mustard and turnip greens with a side of chipatis and brownies for dessert. I love Indian food and this meal was cooked to perfection. 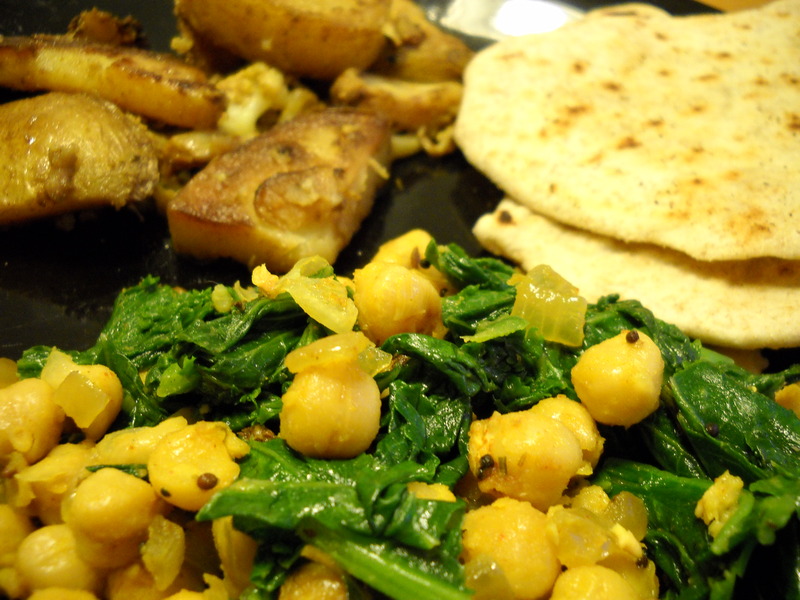 The mustard greens and chickpeas were a great flavor combination. The Aloo Gabi which is cauliflower and potatoes cooked in Indian spices were seasoned and sauteed to create a dish that would satisfy even the pickiest of palates. The brownies were moist and dark with just the amount of pecans to enhance their taste without nut overkill. 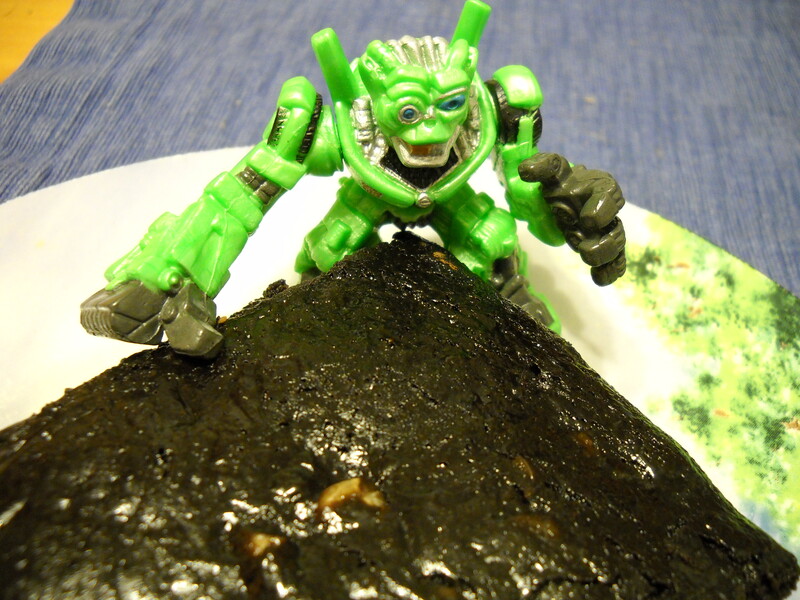 Arthur informed me that his Decepticon was trying to steal the brownie. 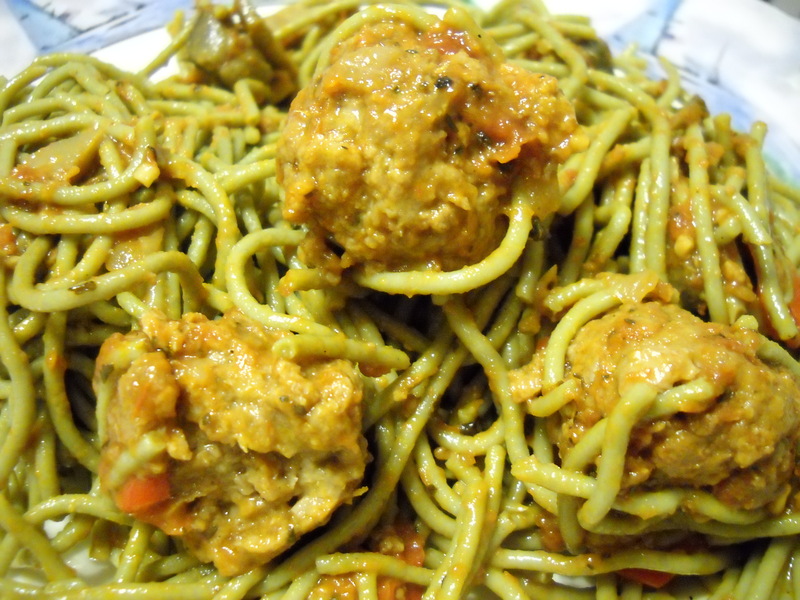 Monday night we were served spaghetti and “meat”balls with a side salad. This was a great dish and I was even more impressed that it was cooked by one of the husbands in the co-op. Not to say that men can’t cook. It’s just that Josh can’t cook. So, I am always impressed when a husband cooks dinner. Actually, let me restate that one. He can cook, but it takes forever and he sometimes forgets a step or two. He is not good at multi-tasking and when he has tried to cook for us, the meal takes a good 2-3 hours before it is ready. And these are meals that should take 45 minutes or less. He will tell you that he is bad in the kitchen and that is why he leaves the cooking to me. 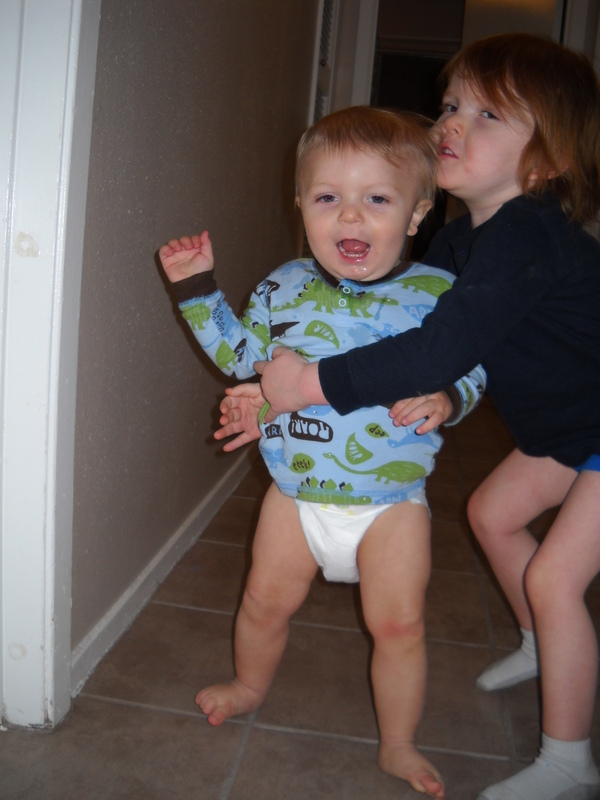 Well I am off to give the boys a bath and have storytime. Hope you have a lovely evening.